2 of 4 fennel, and avocado. 3 of 4 Whisk together 3 tbsp reserved mandarin liquid, minced shallot, lemon juice, sugar, salt and pepper. Slowly whisk in 3 tbsp extra-virgin olive oil. 4 of 4 Heat 1 tbsp olive oil in a large nonstick skillet over medium-high heat. Add scallops to pan and cook 1-1/2 to 2 minutes per side. 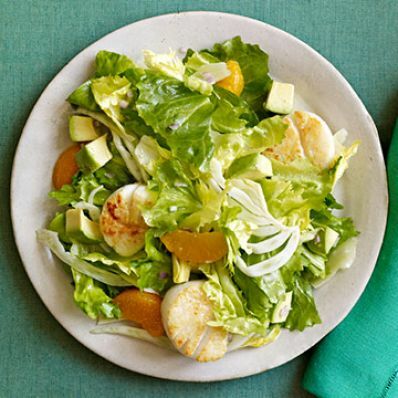 Top salad with scallops and drizzle with citrus dressing; toss to coat and serve immediately.